We can drop off 1 ton bags for you to fill at your leisure and arrange a suitable time for us to collect. If you need more than one bag, this is not a problem at all, 2 skip bags are almost equivalent in capacity to a 3 yard skip. 4 bags can contain almost the capacity of a 6 yard skip. Skip bags are very convenient, we can lift a skip bag over hedges and into awkward locations and there is no need for a permit. We can leave the skip bag with you for up to 1 month from the day of delivery. 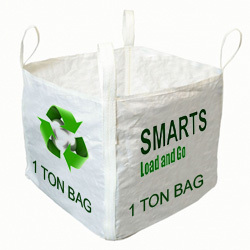 Skip bags are cheaper and more convenient than a skip, Click Here for the price guide.